This past Saturday I ran the Miles for Moffitt 5k with our friends Phil & Elizabeth. I knew that I'd be "taking it easy" since my running efforts have been proving difficult since my second trimester started. 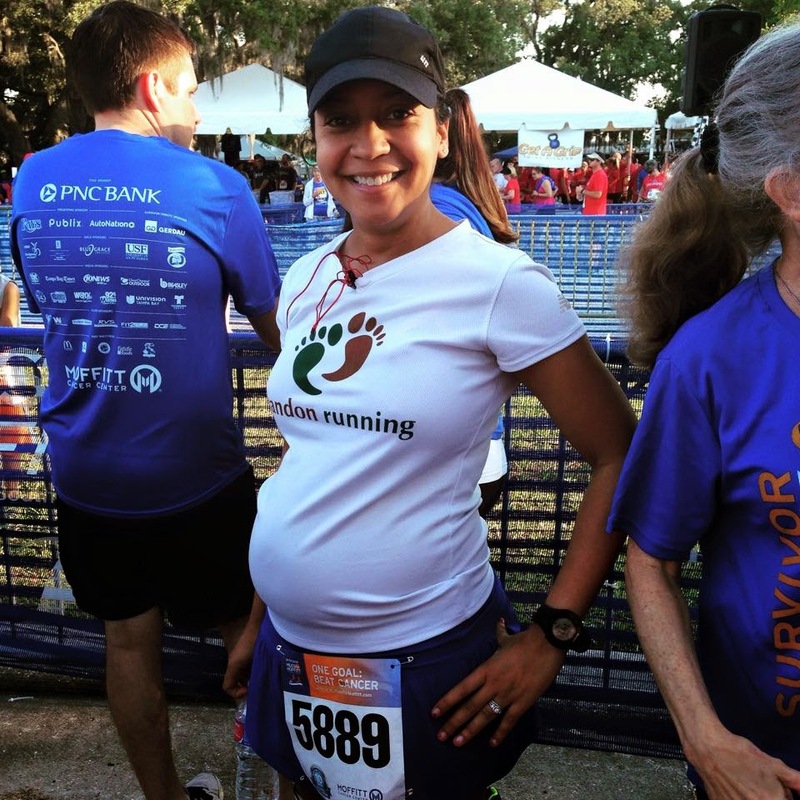 During my first trimester, I ran Ragnar when I was about 7 weeks along and I was 9 weeks when I ran the Gasparilla 15k pretty effortlessly. I ran Gasparilla 15k in 1hr 30min. My 15k PR for this race is 1:29. Although I didn't go into Gasparilla thinking I was going to "race" it or set any records, I was on target to beat my PR until mile 7 when I was feeling sluggish and decided to take it easy to the finish line. My running really slowed down after Gasparilla. Between life getting busy and my no-motivation-to-run kicking in, I didn't make an effort to run more than 3-5 miles a week. I thought I was doing enough to be able to run the Miles for Moffitt 5k this weekend but boy was I wrong! The race started at 8am - the sun was already out and stirring up heat at the start line. I was excited to participate in another race since the Florida racing season is almost basically over and I didn't think I'd get another opportunity until after our little bambino was born. Elizabeth and I agreed on a jog/walk method to finishing the race. My friend Elizabeth is a TROOPER! She just underwent hip surgery last fall and has recovered beautifully. She ran in the Gasparilla 8k and then signed up for the Miles for Moffitt 5k with me. She is always so cheerful and optimistic that I knew she'd stick with me and help me get through. The first two miles we did a 3/4 mile jog with 1/4 mile walk method and this was working pretty well for us. Around the beginning of mile 3 I remember the sun just staring us in the face with little shade in sight. We changed our plan to jog 1/2 mile and walk 1/4 mile. That plan quickly changed again to jog 1/4 mile and walk 1/4 mile until the finish line. We finished averaging 13:40 per mile! In the end, I was pretty happy about this pace. Running has been one of my favorite forms of exercise for the last 4 years. My husband introduced me to running in 2011 and in 2012 we went off and signed up for our first half marathon. Since then, I've run 9 half marathons and 2 marathons. BUT right now I have to admit that running and pregnancy just don't seem to be meshing for me, I definitely haven't been enjoying jogging/walking more than 1-2 miles at a time. This makes me a little sad since I had big dreams to resume running and pick up racing again once my body recovered from delivering our bambino. 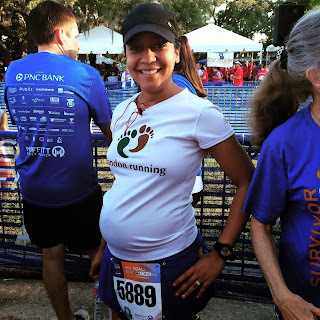 Has anyone else run while pregnant? Did you notice a difference in your emotional attachment to the exercise? I think I'll be kicking running to the curb here shortly and I'm signing up for Prenatal Yoga!